Boil potatoes in their jackets 20 to 25 minutes, until tender but still holding their shape. As soon as potatoes are cool enough to handle, peel skins off with the back of a knife. Dice potatoes, and place them in large mixing bowl. Add cider vinegar. Heat olive oil in sauté pan, and cook onion, stirring often, 3 minutes, until barely soft. 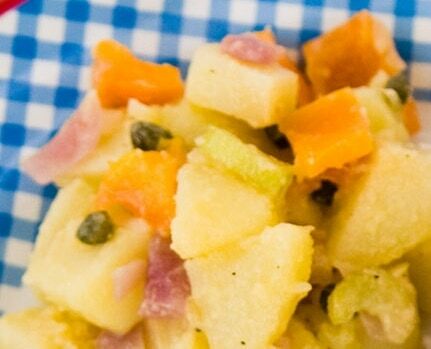 Add onions to potatoes along with mustard, capers, bell pepper, and celery. Season with salt and freshly ground black pepper to taste. Here’s one of my favorite picnic foods: Romanian mititei. YUM!